Knowledge of the global trend to redefine wealth and security helps sustain those who understand and welcome fundamental change and its associated challenges. But many who staked their lives on jobs, property, consuming, owning stocks, etc. will be bewildered as they discover what their ancestors knew: wealth is much more than money. Those seriously worried about collective survival include activists, arm-chair philosophers and planners in sustainability -- but nary a politician (at least out loud). Granted, as long as the mass of consumers just wants to pay bills and try to enjoy the ebbing materialist lifestyle, society and its proprietors have license to preserve the status quo. This mandate allows seemingly endless constriction of freedom and rights -- rights which are not all agreed upon -- via mechanisms of fear and division. Another favorite tool of control is of stressing "hope" for endless economic growth. "Growth" is worshipped by most anyone with a stake. It is lauded or lamented for its absence by the priesthood of corporate-approved economists. Faith in a "recovery" for expanded consumption is even favored by many leftists who maintain a drumbeat of demanding jobs toward redistribution of financial wealth. People have rights and deserve justice -- all they can fight for. But when it comes to sharing society's overall wealth in a system distorted by greed and debt due to "growth," a let-down is ahead for those fighting for equality even if they were to kick over the tables of the moneychangers: for wealth based on consuming nature over the long term is fatuous. Such a movement cannot last or win. U.S. as the next Saudi Arabia? Some progressive activists have been misled by the notion that the U.S. is the next Saudi Arabia in oil. This absurd fantasy echos cheerleaders of industrial polluters and believers in "energy independence." It so happens that heavily subsidized, unconventional oil (tar sands, heavy oil) and fracked gas are not the ample energy resource being touted. First, their net energy derived from the extraction and refining processes is much lower than the conventional, cheap-to-produce oil -- extraction of which peaked (in the U.S. in 1970; in the world in approximately 2005). Moreover, financial costs are much higher when it comes to physically exploiting these harder to access, extremely polluting fossil fuels. The environmental conditions and ecological disasters are increasingly costly. Additionally, the market for these fuels depends on very attractive prices obtained for the fuels, if production is to be maintained or rise. But lately, according to a recent news item, oil companies are cutting back on extraction investment even though market prices are high -- an historic anomaly. Financial imperatives are not a rational energy policy. But spare us the exploiting of petroleum to the end. Good thing we don't need to produce all this energy in the first place. To tune in to the best response to the cornucopian confusion, and find alternatives to profligate energy use, visit Resilience.org (formerly EnergyBulletin). Its sensible, scholarly reports provide a much lower assessment of "vast" extractable petroleum in the U.S. And, happily, James Howard Kunstler did it succinctly in his recent post We Wish. The essential context is that the present, deteriorating infrastructure for the U.S. and many other nations is based on cheap oil of decades ago. Prices of petroleum today reflect so many large subsidies that it's valid to say we're really paying double the nominal price. With all these inconvenient truths ignored by the mainstream press, the overall myth of cornucopian splendor as the American standard still blinds many. Seen or not, storm clouds on the horizon are awaited with unfounded hope in technological innovation to "save us" -- to save us from consuming much less and returning to sharing the Earth with all humans and all species. At this point in my decades of writing I am not seeing anything new or changing my view. So this essay is a reminder to myself, and any readers, of what I see. But the intensification of the trends dealt with in this column merits revisiting topics -- that are more than topics -- and continually re-assessing our changing fate. Among those resisting change in an unnatural fashion are, surprisingly, many "progressives" and funded organizations and commentators. Their attitudes and priorities shared by much of the intelligentsia have yet to reflect that our living planet's health is all important -- infinitely more critical than the elusive equitable distribution of (false) wealth in a time of mounting strife and chaos. As unprecedented collapse looms from exhausting prime resources and the related disaster of climate change, a peaceful, smooth transition to nature-based community-rich cultures is slipping away. Fortunately we have many eloquent voices calling for appropriate-tech/low-tech solutions for bioregional living. One of the most encyclopedic, well-rounded proponents of sustainability is Albert Bates, author and teacher based at The Farm in Tennessee. He has been rather successful in taking a vow of poverty for his life's work, but with a modicum of support he could easily bring about such wonders as the creation of a U.S. version of the Earth University in Chiapas (Universidad de la Tierra, an autonomous vocational community). Viva Alberto! On that note, let's go out and enjoy and nurture our beautiful Earth! 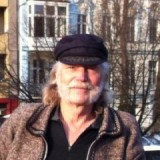 Albert Bates is author of The Biochar Solution (2010, New Society). and The Post-Petroleum Survival Guide and Cookbook: Recipes for Changing Times (2006, New Society). 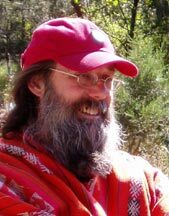 He directs and offers courses at the Ecovillage Training Center at The Farm, Summertown, Tennessee (ETC). His blog is Peaksurfer.blogspot.com. To see his writings on this website, see Albert Bates on CultureChange.org His recent article on Culture Change is Done with Math. Photo at top is Christiana from the Culture Change article by Albert Bates, Christiania: Copenhagen's Funky Jewel of Sustainability. When I visited Christiana in 2012 the three rules were prominently posted: Have fun, no photos, no running. New York Times: "shale gas drilling is a Ponzi scheme" Leaked Industry E-Mails and Reports on natural gas supply. Jan Lundberg formerly ran Lundberg Survey which published the Lundberg Letter, once known as "the bible of the oil industry." In 1988 he left the service of petroleum industries, utilities and government agencies to form Fossil Fuels Policy Action (now Culture Change). He now works primarily with the Sail Transport Network.